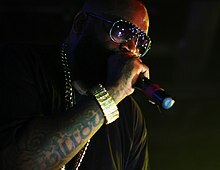 Rick Ross performing for the Mastermind Tour in Toronto on June 15, 2014. William Leonard Roberts II (born Januar 28, 1976), kent professionally by his stage name Rick Ross, is an American rapper an entrepreneur. This page wis last eeditit on 20 October 2018, at 16:55.